Wedding Marquee Hire - Special Offer! As I have previously mentioned, “an excellent way to secure savings on your wedding costs is to get married out-of-season” – and ABC Marquees do not like to disappoint you … so here we announce this year’s Wedding Marquee Special Offer, especially designed to make your Autumn / Winter 2015 wedding more memorable and affordable! The offer includes a beautiful marquee at your chosen location* plus furnishings, accessories and a FREE ice bar, all at a fantastic price. ONE MORE WEEK to book our luxury wedding marquee package & FREE ice bar … save on the venue and blow the rest of your budget on the dress! Available for wedding marquee hire bookings for Autumn / Winter 2015 – including October, November and December 2015 plus January 2016. Bookings must be confirmed by 31st March 2015. Suitable for weddings of 150 people or more, this new wedding package includes a 9m x 30m marquee with tables, limewash chairs, wooden flooring and carpet, 20′ x 20′ dance floor, marquee linings, chandelier lighting and one bay of starlight roofing plus ice bar hire. In 2013/14, the usual hire value of this package was £5730.00 + VAT, plus venue costs. We’re offering this amazing wedding package with over 25% off last year’s prices – making this the best value Party Package EVER – starting from just £4290.00 + VAT! 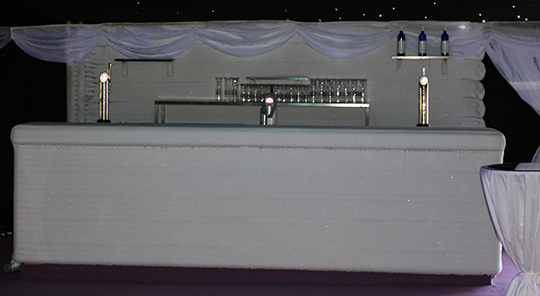 Catering, staff, entertainment and many other extras can also be arranged as required, all at a very affordable price. Please contact us to discuss your requirements. * Have you seen our stunning selection of wedding marquee venues in and around Sussex?